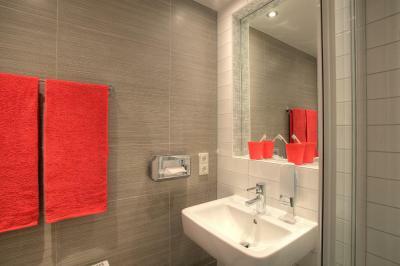 It was close to the train station and the room was super clean. Location was excellent. 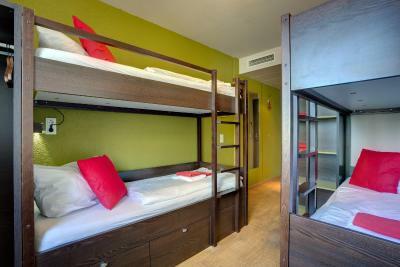 For a small room with 2 bunk beds, it was organized well. Conveniently located with an unbeatable price. 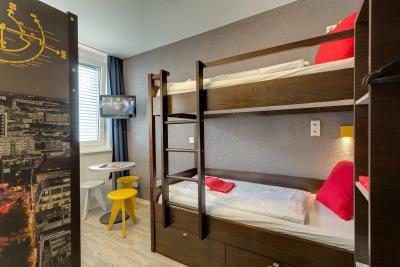 Very clean rooms with reasonable beds. Rooms somewhat small, but we hardly stayed at the hotel anyway. The location for me was perfect. Next to the main train station. The hotel was very clean indeed, warm, beds comfortable and the bathroom a good size. Great fort short stay, 5 minutes from trai to room, just next to train station, good value for money, clean room, bar, overall good experience. Location was perfect for the areas we wanted to visit. Train station was across the street. The bunk room was perfect for my family of 4. 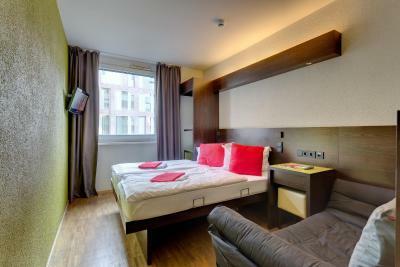 MEININGER Hotel Berlin Hauptbahnhof This rating is a reflection of how the property compares to the industry standard when it comes to price, facilities and services available. It's based on a self-evaluation by the property. Use this rating to help choose your stay! This hotel is in the heart of Berlin, between Berlin Central Train Station and the Reichstag Parliament. 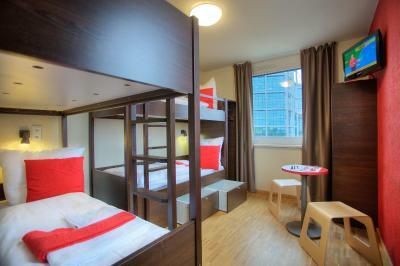 The MEININGER has soundproof rooms with modern design and a flat-screen TV. 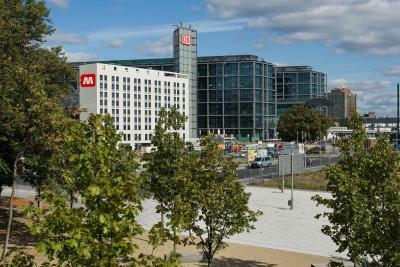 The MEININGER Berlin Hauptbahnhof offers panoramic views of the Government District and the Tiergarten Park. 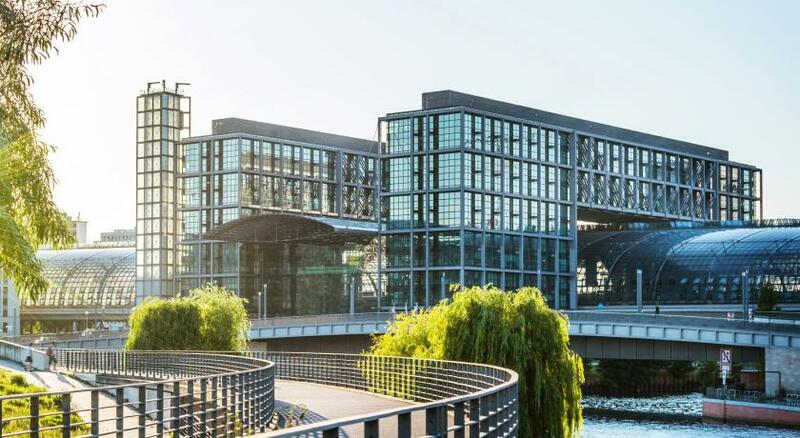 The Brandenburg Gate and Unter den Linden boulevard are a 10-minute walk away, and excellent public transportation connections are available from Berlin Central Train Station. When would you like to stay at MEININGER Hotel Berlin Hauptbahnhof? 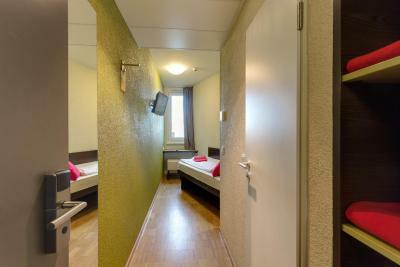 Nonsmoking room with flat-screen TV and soundproofed windows. Please note that different cancelation policies (see Policies) apply for groups of 11 people or more. The hotel will inform you of these policies following reservation. 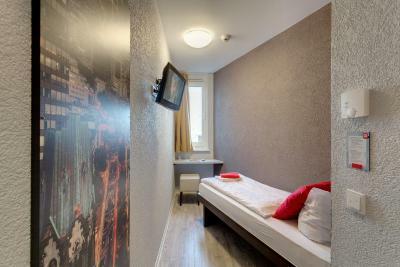 Nonsmoking room with a flat-screen TV and soundproofed windows. 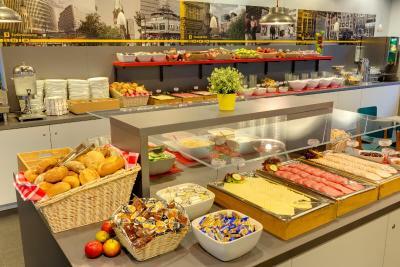 House Rules MEININGER Hotel Berlin Hauptbahnhof takes special requests – add in the next step! 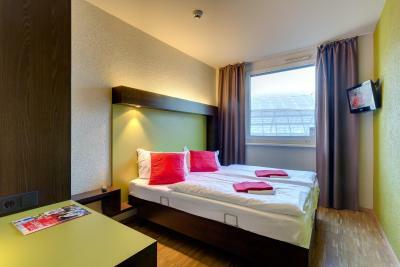 MEININGER Hotel Berlin Hauptbahnhof accepts these cards and reserves the right to temporarily hold an amount prior to arrival. Please note that different policies apply for groups of 11 people or more (see Policies). Free cancellation for groups is only possible up to 60 days before arrival. The hotel will provide you a special group contract, which you will need to sign, and will also contact you with further information. Please note, single beds at the property are just 31 in wide. Location very near main train station. Hotel was in excellent location , would stay again . It was a bit on the small side but adequate for a short stay. Great location beside the Central Station. Perfect for travelling to other destinations after your stay or catching a flight to the airports. You can leave baggage at the hotel for free, but you need to pick up on half or hour. You need to be careful if you need to catch a plane/train. Because you gonna use same queue as check-in queue (sometimes there is a long check in queue). I didnt have complain because its a free service. 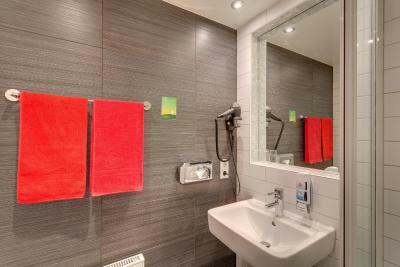 Great location (close to main station), clean room, Room is a bit small but worth every penny. Just everything you need for a short stay. 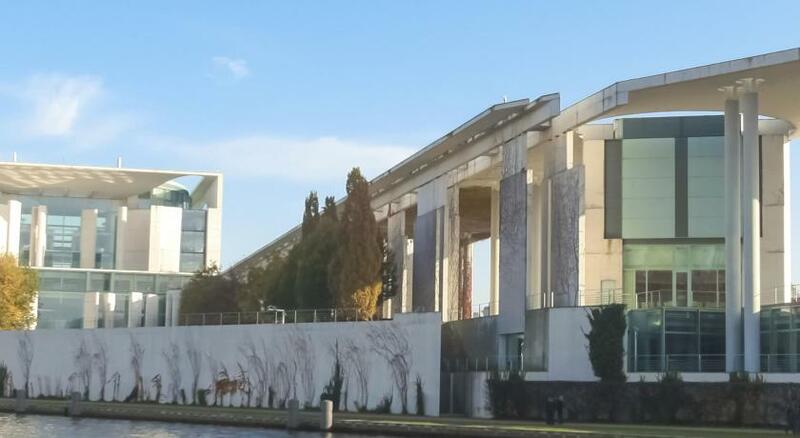 Definitely my first choice if I visit berlin again. Everything was good , for price like this and also breakfast was nice . Location was great , go outside and in every corner you have any transport to go anywhere you want , that was perfect. Really nice place, I like it. The thin mattresses were fine. All the pillows were quite lumpy. It made it hard to sleep at night. Would bring own pillow if I had to go back. Nothing really to complain about, except an irritating detail: why no drinking glass of any kind in the bathroom (plastic or glass)? I’ve reached the age when a take some medication on a daily basis, and need a glass for that. For us train travellers the location is superb. Couldn’t be better. 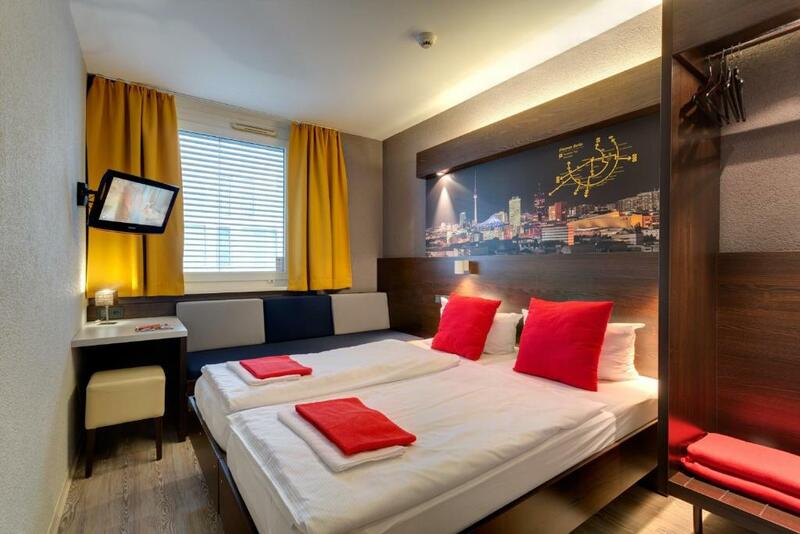 Hotel is more or less a part of Berlin Hauptbahnhof, located only a few meters from the Hauptbahnhof main exit/entrance, on the Washingtonplatz side. Checkin/checkout was easy and unproblematic, and the room/bathroom comfortable and adequate. WiFi worked ok, even though I’m more inclined to use the mobile data networks 4G these days, when that is available, than an unprotected WiFi network such as the one MEININGER Hotel Berlin Hauptbahnhof had on offer.